Clive and his three brothers – one older, two younger – grew up in Crosshaven on Ireland’s bewitching southwest coast. 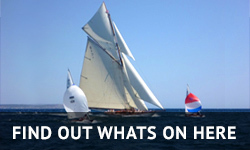 Living a hop, skip, and a jump from The Royal Cork Yacht Club, the world’s oldest founded in 1720, it was inevitable that the family would become engaged with the sea. When Clive was a young teenager, his father bought an Enterprise dinghy for the family to sail, but it wasn’t just sailing that piqued his interest. Clive got hooked on windsurfing, kayaking and canoeing and, age 15, took his dream summer job as a trainee instructor at Oysterhaven Outdoor Adventure Centre. 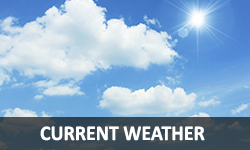 During time off, Clive would glass collect at the yacht club, then grab his gear and windsurf. So far, so wonderfully good. Clive added yacht racing to his windsurfing at the weekends. 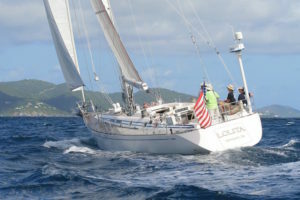 He worked his way through the club racing ranks all the way up to the Frers 51 Moonduster – a prominent boat in the Cork community. It was a rite of passage to crew on Moonduster, and Clive did two Fastnet Races and one Round Ireland Yacht Race on that iconic yacht. By now, Clive had stumbled across his next passion and interest in life – architecture. In 1998, he moved to Dublin to embark on a degree at the Dublin School of Architecture. To keep his fun fund topped up, he bartended at Vicar St (sister to Dublin’s famous Point concert venue) during term time. 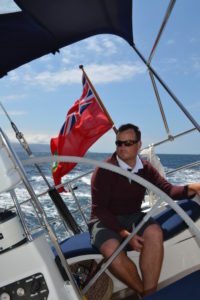 “Despite giving architecture my all, I refused to let my sailing slip, so completed my RYA Yachtmaster in Northern Ireland in 1998 and devoted all my summers to racing. 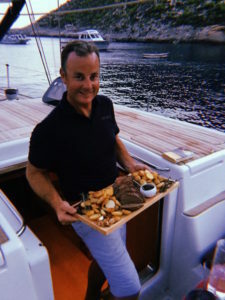 After another year of architecture, Clive was back behind the bar at The Royal Cork Yacht Club and schmoozing the owners and captains of Europe-wide campaigned racing boats, who were in town for the biennial Cork Week 2000. 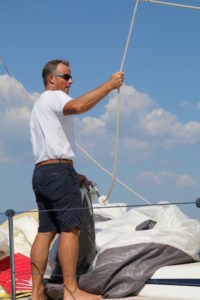 Swan 60R Island Fling was moored alongside Desperado during the event, and Captain Steve ‘Taff’ Dodd took Clive on for the sail back to Hamble via Palma, where they changed sails and stored the race gear in the team container. It was Clive’s first taste of Mallorca. 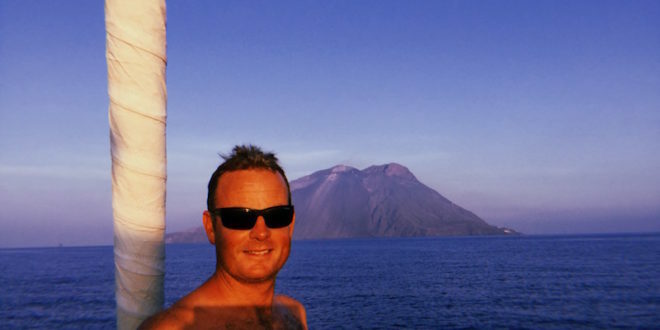 In 2001, Clive raced almost exclusively with Island Fling for their UK, Med and Asia programme. The same for 2002 – with the addition of the RORC Commodore’s Cup. This Corinthian (amateur) version of The Admiral’s Cup featured three-boat teams from across Europe and it was an honour for Clive to represent his country. 2003 signalled a year out of studies and Clive went backpacking in South America with Alice, a fellow architecture student who he’d romanced at Cork Week 2002. He hatched a plan to pay for the trip and get them a free ride home. 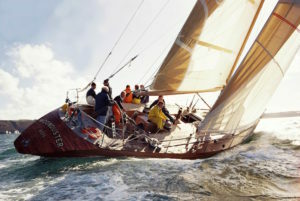 In summer 2004, after a hellish but memorable adventure round Ireland on the bright orange Ker 11.3 Minnie the Moocher, Clive flew to the Nautor’s Swan yard in Finland to help Taff commission the new Island Fling, a Swan 601 which they sailed down to Cowes Week and the Rolex Swan Cup in Porto Cervo. By summer 2005, after seven years hard study, Clive and Alice graduated and the professional sailing came to a halt. 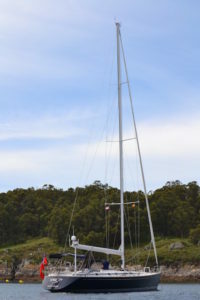 In summer 2012, Clive sailed Tenacity around the handsome Galician coastline and then it was back to the Caribbean for the winter. 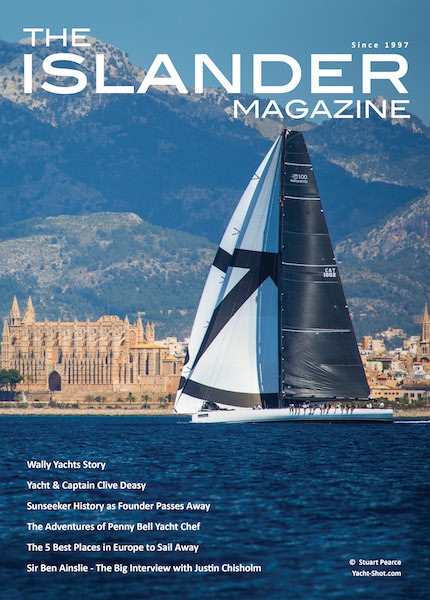 Serendipitously, the elaborate refit that he’d had completed on Tenacity was rewarded with a Concours d’Elegance trophy at the inaugural Rolex Swan Cup Caribbean in March. 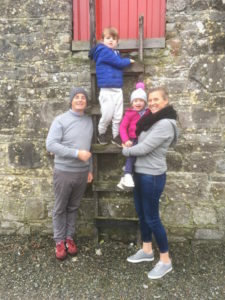 Keen to stay close to his new family, Clive based himself in Dublin Bay and his next captain role was for a corporate day charter business in Dublin – www.gosailing.ie. 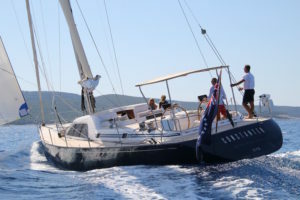 They ran teambuilding events on a 53ft Hanse and 8m RIB. By pure fluke, his co-worker Bref, was the guy he was trainee instructor to at Oysterhaven some 20 years before. So, in April 2015 after selling their café business, Clive, Alice and their 16-month-old packed up and moved to Mallorca – they have been here ever since. Alice and the children (the family of three became four in December 2015 with the addition of a daughter) are also enchanted by Mallorca. The little’uns are at Spanish school and chitchat away in Castellano to their friends, they scoot and cycle up and down Palma’s Paseo, and mess about on the water in the Deasy family RIB. Meanwhile, Alice has embarked on a postgrad with a view to becoming an international school teacher. Island living certainly suits them.